It seems I haven't been taking pictures too much lately. Perhaps partly due to the decreasing usability of my camera lately (just got it back from the shop, so hopefully all better). Or perhaps I just haven't been getting outside too much this winter... Anyway I've been wanting to get something other than tracks up here. 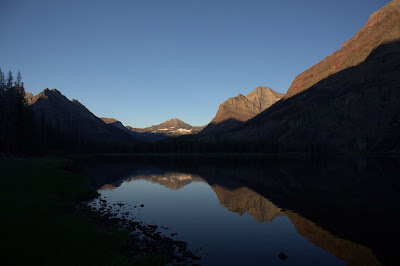 So I went through my pictures and grabbed these from a brief trip to Glacier last summer. Unfortunately I didn't get to spend a lot of time there, but what time I did spend was beautiful. Spring is starting to accelerate around here so maybe I will get some good spring stuff up soon. This track is a little obscure, see what you can figure out. Setting: In the woods in the hills just east of Snoqualmie pass mid October 2008. The main thing that is visible here is the heel pad. The only thing that large with a heel pad that shape in our area is a bear. It is theoretically possible for it to be a grizzly, but highly unlikely because they are quite rare in Washington. 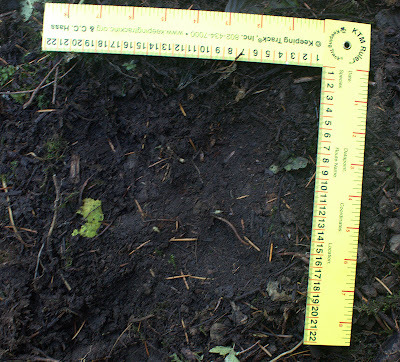 If there were clearer toes and/or claw marks I could say with even more confidence, but am still quite sure that this is a track of a large black bear (Ursus americanus). I am less confident about this answer given the lack of detail in the track, but here goes: The track is facing toward the left side of the image. With the relatively abrupt hind edge of the track, I believe this is a front track. The left side of the heel pad appears a bit wider. It seems that generally the outside of the front heel pad tends to be wider, so I think this is the track of a front left foot. You may have noticed that I have been missing a week a couple of times recently. I'm starting to run a little low on motivation and stored up track pictures and my camera is trying to make it to the shop (just saw to day that it was marked as "Undeliverable as Addressed"). But I had a request to keep it going for awhile longer, so I'll see what I can do. Pocket Gopher, based on the range maps in Peterson's Mammals, probably northern pocket gopher (Thomomys talpoides). 2. What are they (and how were they made)? Possom59 got it right in the comments. These are eskers formed when the gopher makes tunnels in the snow and then back fills them to get rid of the the dirt from its underground tunnelling. Setting: Mid January 2009 in the Snoqualmie valley. There was great tracking in the silt deposited by the flood. These are some of the nicest weasel (Mustela sp.) tracks I have seen in person. Because of the size I think they are short-tailed (M. erminea) rather than long-tailed (M. frenata) which also occur in our region. I'm not sure if there are morphological features that distinguish the species. From what I have heard it can be difficult to distinguish them even with specimens in the lab (without the use of DNA). To me, weasel tracks sometimes look like tiny dog tracks, other times like rat tracks. In this case, if you look closely though you can see five toes showing (clearer on the right side). Often, as is the case here, I don't see much in the way of heel pads showing up. 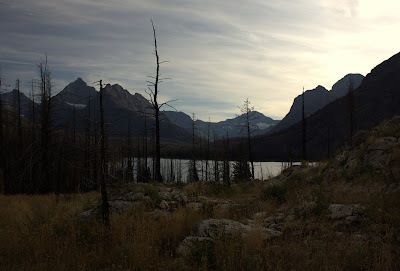 The smaller trail going across the picture is vole (Microtus sp.) Same sub-family as the muskrat last week. Note the thin finger like toes, also that it is moving in a trot which is a common gait for this group of rodents and unusual for other common rodents in this area. In the lower right corner there is one track that appears to be the hind track of a smaller rodent, perhaps a deer mouse. Also there are at least two trails left by invertebrates, perhaps earth worms. The weasel is moving in a 2x2 lope and the vole is moving in a straddle trot (a trot with the hind feet falling outside of the front).